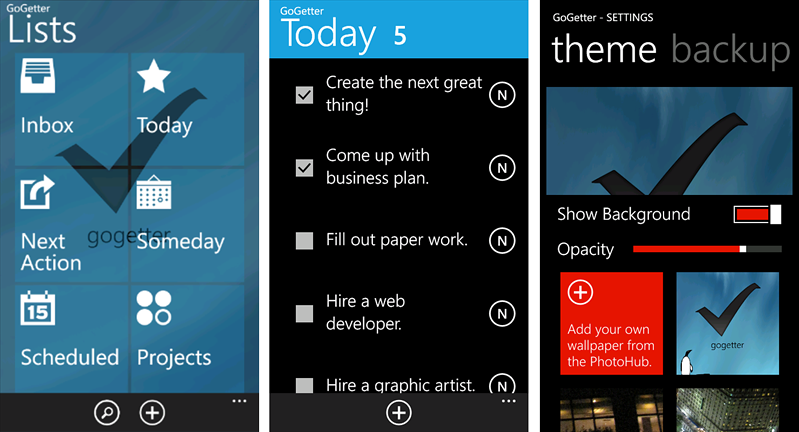 GoGetter is a task manager for your Windows Phone that not only helps you manage current tasks but the "to do" list you plan to get to one day. Add live tile support, DropBox backup, and a customizable layout and GoGetter is a nice task management app for your Windows Phone. Inbox: Here is where you list all of the day to day tasks you need to do. Today: These are tasks that need to be done today. If you generate a task in the Inbox that is due today, it'll show up in the Today list. Next Action: These are tasks that need to be done but not necessarily right away. Someday: Here's where you list future projects when you have no idea when they need to start or when whey are due. Schedule: For tasks that have a defined start and due date. Projects: This area is for the more defined projects that have a start and due date. Done: This is where you'll find any task that has been completed. An archive of your activities. Each category will have an add button that will pull up a fill-in the blank template. Each template has a reminder option Once a task is created it will be listed on each category page and most can be pinned (projects can't) to your Windows Phone Start Screen. Task listings on the category pages can be sorted, emailed or sent via SMS from the three-dot menu. From the main page of GoGetter you can access the settings menu from the three-dot menu. Settings allow you to edit the context field for your tasks (at office, at home errands, etc); edit the estimated times field; choose GoGetter's theme; choose your Live Tile color; and set up the DropBox backup feature. The theme setting allows you to choose the background wallpaper from a group of images or use a photo from your Windows Phone Pictures Hub to use. I found GoGetter to be a nicely laid out task manager. It's nice to create tasks in the various categories and anything due today, will get sent to the Today list. 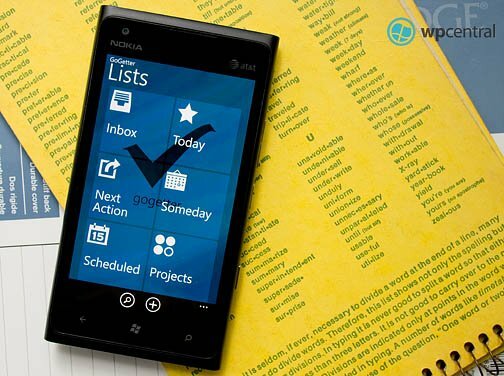 If you are looking for a decent task manager for your Windows Phone, GoGetter is worth a try. There is a free, trial version available to let you take GoGetter out for a spin. The full version is currently running $.99 and you can find it all here at the Windows Phone Store.